A tantalising taste of our sports car future left judges hungry for more. THIS shapely, scissor-winged, plug-in hybrid coupe was the most divisive Wheels COTY 2016 contender of all. 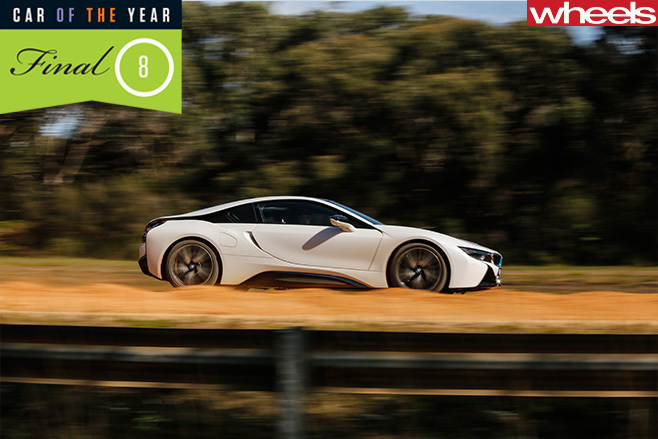 There were judges who loved the way the i8 drove every bit as much as its concept-car looks. And there were some unconvinced by the BMW, arguing that its performance and handling failed to keep the promise made by its sensational styling. Few cars have made the journey from show stand to showroom so successfully as the i8. There are countless detail differences between the Vision Efficient Dynamics concept unveiled in Frankfurt in 2009 and the production-ready i8 revealed in the same place four years later, but the visual drama was little diluted in the process. BMW also remained reasonably faithful to the broad technical detail of the Vision concept. Its centre section is a carbonfibre cell, with aluminium subframes bolted on fore and aft to serve as mounting points for the suspension and steering, and to cradle drivetrain components. Behind the passenger compartment is a three-cylinder 1.5-litre turbo. It’s from BMW’s modular engine family, but boosted to produce a hefty 170kW. It drives the rear wheels through a six-speed automatic transmission. Up front, and driving the front wheels, is a 96kW electric motor. This is identical to that used in last year’s COTY-winning i3, save for a reduction in power and the addition of a two-speed transmission. 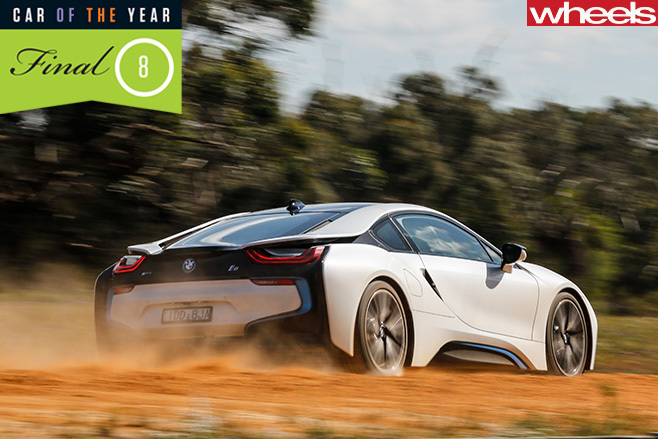 The i8 can run in three different driver-selectable modes. In eDrive it’s a front-drive electric car, drawing on energy stored in a 5kWh usable-capacity lithium-ion battery pack. Once this is used up – around 35km is the claimed range – the i8 switches to Comfort mode, where internal combustion and electric power are blended. Nudging the gear lever to the left engages Sport mode, where the internal-combustion engine runs full-time. 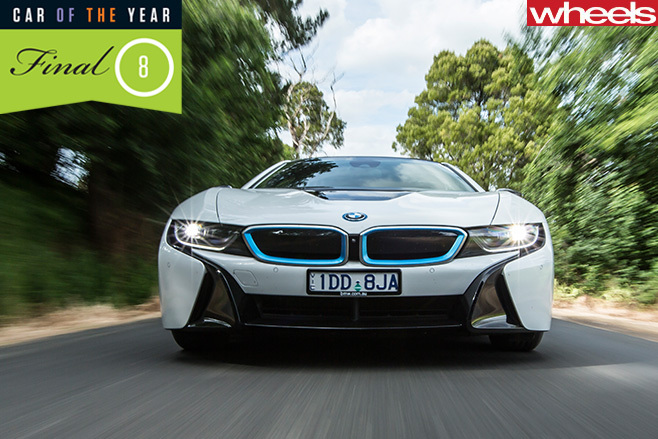 Some judges were critical of the way the i8 launched from rest in Sport mode. The same judges were equally harsh in their dismissal of the BMW’s performance as inadequate. And there were grumbles over the finesse of transitions between engine and electric power. Other judges were smitten by the sound of the turbo triple when working hard in Sport mode. They also liked the flavour of the i8’s performance in this mode, with the hybrid system’s full 266kW and 570Nm on tap. There was something approaching consensus on the i8’s dynamics. The BMW’s ride impressed most judges. But while the i8 has no handling vices, it lacks on-limit adjustability. 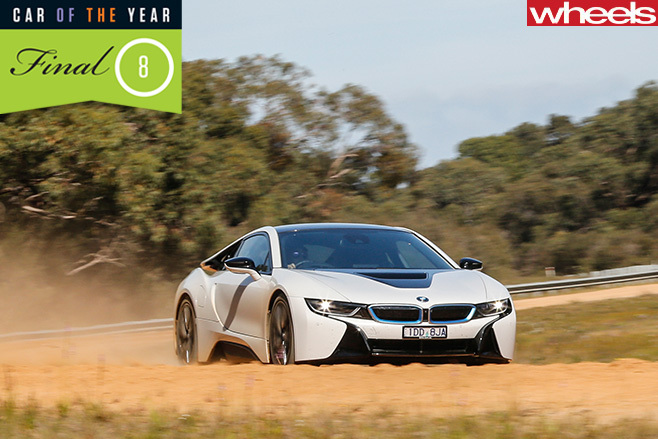 The exotic core of the i8 goes some way to justifying its sky-high price. But the car also lacks equipment that $300,000 should buy. Although the BMW is fitted with sufficient passive safety – six airbags, for example – it lacks an autonomous emergency braking system. The way the i8 split the judging panel on key points like function, practicality and value was fatal. Without broad support it’s simply impossible for a car to make it to COTY’s closing stage.